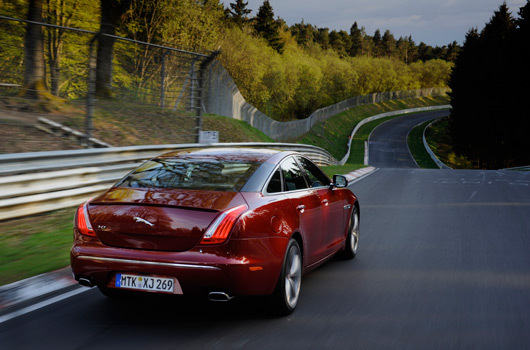 Freelance motoring journalist Karl Peskett was recently at the Nürburgring as a guest of Jaguar. He was kind enough to pen a few thoughts for us. The Nürburgring. It’s the name which strikes fear into the hearts of many, and awe into the minds of others. It was named Green Hell by Sir Jackie Stewart—“Green” because it’s surrounded by forest and fields, and “Hell” because, as Niki Lauda can attest, the risks can often outweigh the rewards. It’s like the Crowded House song, “Four seasons in one day”, because of its length. The Nürburgring “Nordschleife” (Northern Loop) is a track that experiences such a diverse range of weather conditions that the north end of the track is often a complete contrast to the southern end. Its elevation also affects conditions in this respect, sitting at 620 feet above sea level in the Eifel mountains. Every cloud in the Atlantic makes a path directly for the track, so you should always account for a risk of rain when you visit the track. The Nordschleife is motoring Mecca, though, and almost all petrolheads will make a pilgrimage at some point. Before you do, though, you need to know what to expect, because often the expectations you have are shattered once you arrive. You’ll know you’re near the ‘Ring by the amount of Porsche GT3s which congregate on the local roads. Throw in a Caterham or two, and some test mules for Jaguar, BMW and Audi, and you can sense the gravity of the ‘Ring. There’s a small roundabout close to the entrance, and a modest metal gate. It’s not a swish entrance, or an area in which fanfare is common—this is just a track in rural Germany after all. What were to be the actual tourist attractions are further along, near the Lindner Hotel, but the rollercoaster still isn’t running, years after it was built. It’s what lies behind that gate, though, that makes this place so special. AUSringers was invited to experience the track during a closed session, with a lead driver showing us the lines to follow. Tom Schwister, who has raced in BMW ADAC Formula Junior, Formula Renault, Formula 3, Champion Formula BMW ADAC, Renault Clio V6 Trophy and Porsche Carrera Cup, is the man who is taking the lead. Tom is in his late 30s, with a head-full of dark brown hair, and a quiet but confident disposition. He’s been a Nürburgring driving instructor for around 12 years, so his knowledge of the track is invaluable. Having a local instructor is by far the best way to tackle the track, because the Nürburgring is one of those places where you may think you have yourself lined up ready for the corner, but you should actually be on the other side of the track. After heading through the gates, we line up at the starting position, off to the right of the track. A boom gate is lifted, you drive through a laneway, and then you are onto the Nordschliefe. The first section is part of the main straight, which then slightly bends to the left. A couple of simple corners right and left, then lead to a hard right turn which is blocked by a wall, so you can’t see what’s on the other side. It’s one of the slower sections of the track, however, meaning you shouldn’t run into too much trouble. You then pass the point at which most companies use to begin the timing of their official laps. The first left hander is quite easy after that, and it’s quickly followed by a couple of tight left and right turns in which you can happily clip the kerb and use the wheel to follow easy left and easy right. And this is where the trick to driving the Nordschleife comes into play—steering movement. Tom tells us to follow his line and just watch what the wheel is doing. Amazingly, it doesn’t move much at all; just a few degrees each time, and a bit more on the sharper corners. 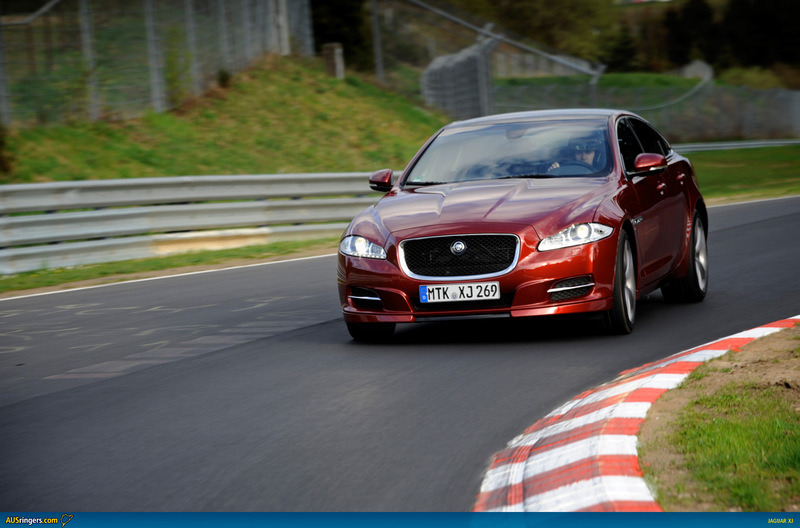 The secret to getting a good lap time at the Nürburgring is simple: Don’t move the wheel too much. The less steering angle required, the quicker you’ll end up being. 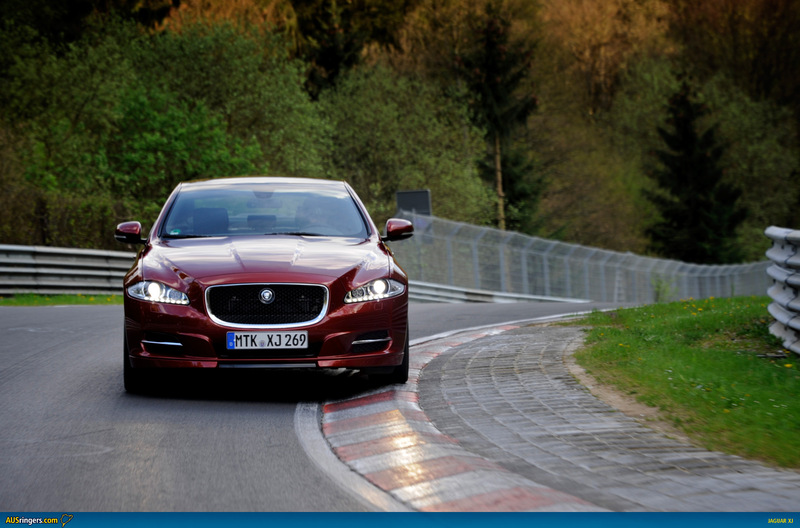 It proves true, too, with sharper steering throwing the car off balance, or even inducing oversteer. While that might be fun—actually, yes it is fun—it’s not fast. Some corners are in fact double or triple apexes, and if you try to steer into each apex you won’t follow the correct line. One fluid steering movement, one steering angle and you’ve set the car up to tackle several corners at once. Unloading the wheel as soon as you can straightens the car up so you can get onto the throttle earlier. The later you can brake, and the earlier you can accelerate, the quicker time you’re going to put in. A word of warning to the uninitiated: this is not the track for heroics. Don’t think you’ll be able to rock up and then start coming into corners backwards, powersliding your way through the track like a D1 champion. Sure, Sabine may be able to do it in her M5 Ring Taxi, but we’re talking someone who knows each corner intimately. Drifting on the Nordschleife is not advisable for one very important reason—the track is narrow. Like, liquorice-strip narrow. That means there’s no runoff. It’s track, then kerb (sometimes, if you’re lucky), and then barrier. Occasionally, on some of the tighter corners there will be a little bit of kitty letter after the apex, but for the most part, you’re on your own. Crash into the barrier as well and there’s little sympathy—you’ll be paying for any damage you’ve done to the track or armco. Further along the track you’ll come across a section with open left and right corners, but again, with the limited steering rule, you can straightline that section, speeding up your approach to the following left hander. I found myself turning in too early initially, but following Tom’s line, a bit later on the brakes and a bit later turning in would set the car up ready for the correct line out of the corner. Unwind the wheel smoothly and you’re ready to jump back on the gas and power away. That is, of course, until the rain came. All of a sudden, the track takes on a completely different dynamic. 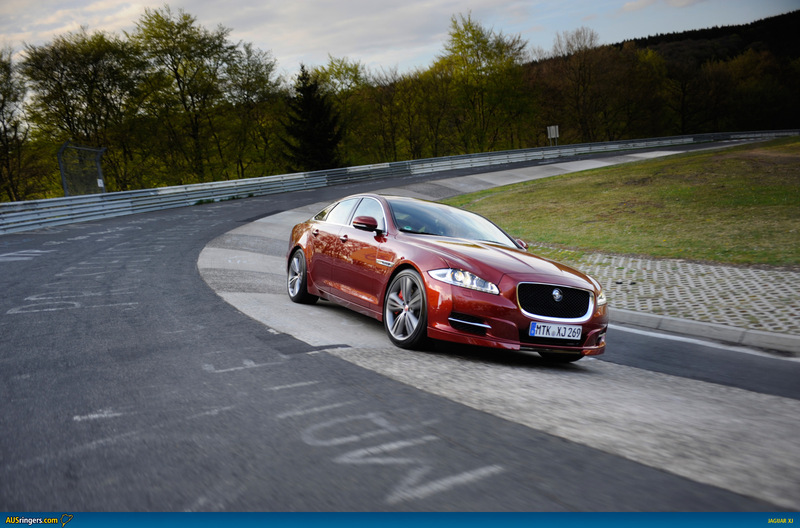 The main straight doesn’t drain the water away that quickly, so you have a very real risk of aquaplaning. And if your car is fitted with semi-slicks, you may as well raise the white flag there and then. With our lead-follow set up, the cars behind suffer dramatically from water spray and it’s virtually impossible to see the car in front. The trick then is to look at the road—the water parted by the tyres shows you the exact line that the car in front has taken. While that’s helpful for placing your wheels and seeing how Mr Schwister clipped apexes, it doesn’t show you how grippy or slippy it is. Actually, the worst time to drive is after a brief shower, because the water is draining off and making it impossible to predict grip levels. At least if the rain is continuous, you know what to expect. While our cars were 550hp supercharged Jaguar V8s with rear-wheel-drive, it was a good thing they had a track mode for the stability control system; it allows for a certain amount of slip but doesn’t let you get too far out of shape. In the wet, the Nordschleife can be broken down into two areas: 1) The first three-quarters and 2) the last quarter. Broadly speaking, the first three quarters are the older sections of tarmac, meaning plenty of graffiti (paint makes the road like black-ice when it’s wet) and old surface, so grip is almost absent. The last quarter or so has had new asphalt laid across it and you can feel a huge difference in how well the car grabs onto the road. In the wet, the limited steering rule plays an even more important role. While everyone else will be skidding about, spearing off the track, a slightly more disciplined approach with throttle application and steering input means you won’t get the car out of shape. Very slowly unwind the wheel when exiting corners and you won’t risk ending up backwards and into the armco. There are two “jumps” on the track (the most famous being Flugplatz), and on both, you’ll want to have the wheel straight before you head over them. Likewise, brake before the jump and after the car is on the other side and the suspension has settled. The Karussell and mini-Karussell are left-hand bends in which the car drops into a steep embankment. The trick here is to keep your left wheel hard into the corner and DO NOT come out until the end. The mini-Karusell is the most dangerous, as it doesn’t seem that steep, but if you leave it too early it’ll launch you backwards. In the wet, it’s the most critical to stay with the corner and don’t let bravery overtake knowledge. In our time at the Nordschleife we were able to experience the track completely dry and sodden with water. Both require knowledge of the track, but more importantly, both require a modicum of self control. If you expect to turn up and put in a sub eight minute time without any experience, then you may as well stay home. Schwister says that it takes around 50 laps to get to know the track and another 50 to become somewhat competent. Sure, you can study it using GT5 or another race simulator, but all that will tell you is where the corners are. There’s no sense of elevation or the stomach-compressing G-forces which tell your lunch to exit your body. The Nürburgring Nordschleife is the racetrack which is the benchmark for real motoring enthusiasts—forget the TopGear track—the fact the public is invited to take part makes it something rather special. 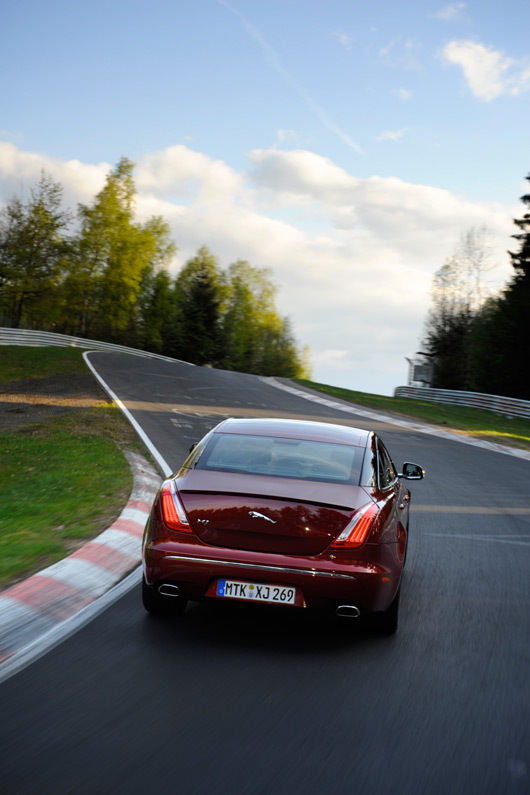 If you’re a true petrolhead, then a trip to Germany and a visit to the Eifel Mountains must be one of your priorities. It may be called Green Hell, but for a car enthusiast, it’s motoring heaven.